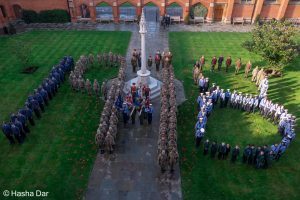 We marked the 100th anniversary of the end of World War I with a very special Armistice Day and Remembrance Sunday Service. As usual our School Chaplain, the Rev Ivan Moore, led the service which this year took place in the School’s Great Hall rather than the Chapel. This allowed for increased numbers of Old Bancroftians, staff, pupils and parents who wanted to join the nation in paying their respects to those who made have sacrifices in conflict. Major Graham Goodey (1993-2000) and Major Laurence Baum (1998-2005), two Old Bancroftians who are currently serving in the forces, read biographies of two Bancroftians who had died in the war. The story of Cuthbert Hickman who, although he sustained many wounds in action, died from influenza just 24 hours after the Armistice was particularly poignant. Gilbert Waterhouse’s poem “Bivouacs” was also read by the current OBA President Ed Sautter (1970-1977). Waterhouse was an Old Bancroftian and war poet who was killed on the first day of the battle of the Somme. These biographies very much gave the sense of young lives and promise cut short by the war. Further biographies were available to read as part of a display which had been prepared by our librarian Kate Squire. Members of the Bancroft’s community had hand-produced over two hundred glazed ceramic poppies, most of which were inscribed with the name of an Old Bancroftian who gave his life in the service of his country. These “planted” in the School Quad around the Memorial to the 167 Bancroftians who gave their lives during the 1914-18 conflict. They were available to purchase after the service with all monies raised will be split between two charities: Combat Stress, which helps former servicemen and women deal with trauma-related mental health problems, and The Royal British Legion. During the service the Bancroft’s Singers gave a very moving rendition of ”Abide With Me”; the Concert band played Holst’s March; the Chapel Choir sang “Irish Blessing” by Chilcott. Members of the School’s Combined Cadet Force and Sea Scout Troop, which both played an important part in the morning’s events were encouraged to form the date 1918 in the Quad afterwards. Wreaths were laid by on the School’s war memorials by Sixth Form members of the Cadet Force RSM Martin Prusa and Cpl Juliette Balchin.